Santa Fe and Taos are both known around the world for the large number of artists and art galleries that make their home in these old Spanish towns. Santa Fe, with more than ten times the population of its northern neighbor, certainly has the edge in sheer numbers of art professionals. Taos, however, claims more artists per capita than Santa Fe-in fact, more than any other town in America. It also comes as a surprise to most people that Taos boasts the older of the two art colonies. In the fall of 1898, two young, East Coast painters, Bert Phillips and Ernest Blumenschein, stopped in Taos on a painting trip around the West. Phillips was so deeply moved by the place that he stayed for the rest of his life, serving as host and anchor for other artists. In 1915, six of these transplanted artists, Bert Phillips, Ernest Blumenschein, Joseph Sharp, Irving Couse, Herbert Dunton, and Oscar Berninghaus, formed the first professional artists’ association in the southwest, The Taos Society of Artists. Eventually topping out at a modest membership of eleven active and eight associate members, the organization itself was almost incidental to the Taos art colony. What has given The Taos Society of Artists its lasting fame is a large and masterful body of painting which recorded and interpreted the people and landscape of New Mexico. 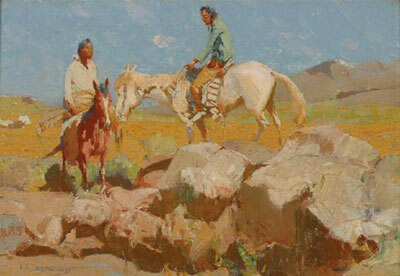 The Society was the first professional art colony to devoted to painting the Southwest and bringing Southwestern imagery to the attention of the national art audience. Turn-of-the-Century Taos was a small, remote village of Hispanic farm families located next to the centuries old Taos Indian Pueblo. It took some measure of courage for these first artists to move to a town with few Anglo residents, few tourists, no galleries, and no local market for their art. The local artists of Taos were Hispanic santeros who painted and sculpted images of the Catholic saints for themselves, their neighbors and their churches. Members of The Taos Society of Artists were an anomaly in such a place. The demand for their work lay only in far-off cities. Yet, it was just that isolation that attracted artists to Taos. The landscape, people, and pace of life in this high desert town fired their creativity and provided the inspiration they needed to achieve their individual artistic goals. All of the Society’s members were representational painters trained in the romantic tradition of 19th century academic art. 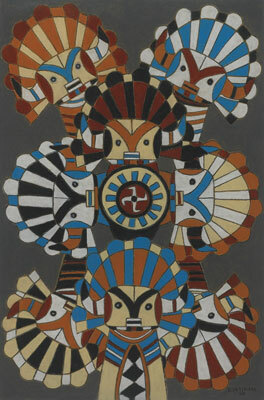 However, there is no single “Taos Style,” as each member’s work was filtered through their individual artistic temperaments, philosophies, and techniques. They also had been influenced to different degrees by modernist art concepts coming from European painters such as Cezanne, Matisse, and Picasso. In general, the older members tended to adhere more closely to their academic training while the younger members were more open to modernist experimentation. Yet, no members of The Society could be considered “cutting edge” artists of their day. Where all the members excelled was in painting evocative images of a region of the country that ordinary Americans were just beginning to discover. Few art buyers of the time were interested in modernism. The growing trend was toward distinctively American scenes-“truly American art”-whether it was rendered in romantic, impressionist, or modernist modes. The Society’s images of the exotic, yet American, Southwest suited the audience. Their work met with consistent critical acclaim and gushing press coverage in every major city where the Society sent its annual traveling exhibitions. The artistic goal of a majority of members was to convey the romance and exoticism of the cultures and landscapes of the Southwest. They saw New Mexico as a place relatively unspoiled by Eastern civilization, but they felt some urgency in capturing images of ways of life they believed were rapidly disappearing. Through genre scenes, landscapes, and portraits, they conveyed what they felt was the essential American spirit of the Southwest’s land and its people. Joseph Henry Sharp (1859-1953) was the oldest member of the Society and, by consensus, its spiritual leader. He also was the first to visit Taos, sent on commission by Harper’s Weekly in 1893. Even as a child, Sharp had been fascinated with Native Americans, and started his career in the west painting highly accurate Indians portraits, viewing them almost as anthropological records. By the time Sharp purchased his Taos studio in 1909, however, he had become more interested in the aesthetic possibilities of his subjects. Though he executed many fine landscape and still-life paintings, Sharp is best known for rendering Native figures in local settings; sometimes as expansive as a plaza full of pueblo dancers, but often as intimate as a single figure at fireside. To get the aesthetic and emotional effect he wanted, Sharp often dressed his Taos Indian models in the clothing or artifacts of other tribes. But, in these paintings done at the peak of his career, the purpose was not literal accuracy, but conveying deeper feelings and truths about the subject’s character and way of life. Sharp’s romantic, firelight scenes are now considered the signature works of The Society. Bert Geer Phillips (1868-1956) was the first member of the Society to settle in Taos and was a willing host and tour guide to the many artists who followed him there. 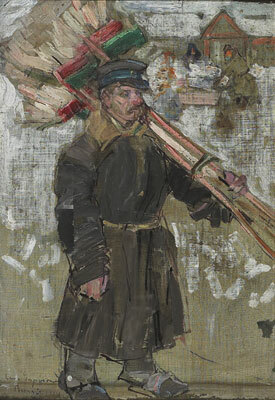 Phillips was passionate about his adopted town and its citizens, and his emotional attachments are revealed in his work. His Native American paintings are idealized representations of a “pure” way of life, not depictions of actual people and places. These sentimental images have a light, sweet quality that might best be compared to love poems. In contrast, Phillips’ paintings of Taos’ Spanish community are more realistic portrayals of the work, pastimes, and devotions of families who had lived for centuries on the same small farms. Ironically, it was Phillips’ Indian paintings that made his reputation during his lifetime, but his Hispanic subjects are now considered his finest artistic accomplishments. Courtesy of Matthew Chase Ltd.
Oscar Edmund Berninghaus (1874-1952) was the only member of The Society who never attended art school: he was trained as a commercial lithographer in his native St. Louis. Nevertheless, his artistic talent was sufficient to garner important illustration commissions as a young man. Berninghaus first visited Taos in 1899 to create watercolors for the Denver & Rio Grande Western Railroad. 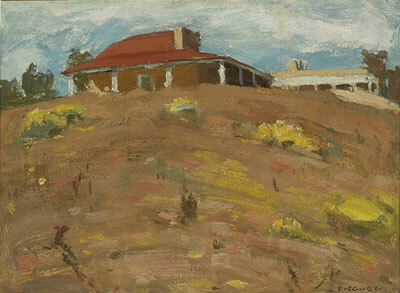 He was so taken by the light and landscape of New Mexico that he resolved to become a full-time painter. Although he had never painted in oil before his first Taos visit, he developed his eye and his highly realistic technique by spending all of his summers painting in Taos. He moved there permanently in 1925. Berninghaus wished to convey the overwhelming beauty of the land and the romance of Native and Hispanic customs. Yet he did it with an eye toward accurate detail. He loved the sweep of light on the mountains and valleys, and many of his canvasses portray local people going about their daily tasks enveloped by the expansive landscape of New Mexico. Eanger Irving Couse (1866-1936) was probably the most famous of The Society’s members during the early 20th century. He won most every award given by the major national art competitions, and many critics of the day considered him the finest “Indian painter” in America. Consistent with the tastes of the time, Couse’s paintings are also the most romanticized representations of Native Americans to issue from The Society. Couse was an academic figure painter who made compelling images not only through his skillful rendering of the Indian as an aesthetic subject. He also successfully tapped into the prevailing romantic stereotype of the Indian as “noble savage” living a natural and uncorrupted existence. 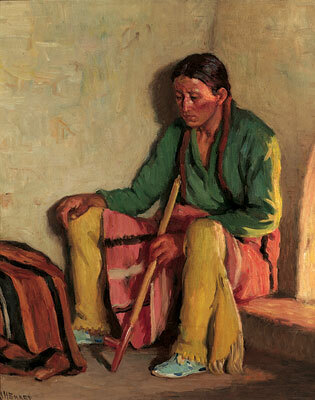 Most of Couse’s paintings depict Native men in some “characteristic” activity such as craft-making or hunting. A single canvas might show a Taos Indian man wearing Sioux leggings, flanked by Acoma pots, and weaving a Navajo blanket. As with Sharp, Couse was unconcerned with documenting the specifics of Native life. Aesthetic and emotional content was the purpose of his art. William Herbert “Buck” Dunton (1878-1936) was the son of a prosperous New England farmer, but longed to know the rough, romantic life of the western cowboy. As a young man, Dunton spent his summers in the West, hiring out to trappers, hunters and cattle outfits, learning the ways of life on the range. During the rest of the year, he was in New York, developing his artistic skills and building a reputation as a leading illustrator. During his relatively brief career he illustrated more than 60 books plus articles in every major national magazine. By 1912 Dunton had become one of the most sought-after illustrators in America and had the financial means to move west and devote himself to his own art. Rather than painting the local Native and Hispanic peoples, Dunton focused his art on documenting the vanishing cowboy. He knew that the wide open west of his youth was being fenced in, and because of his early experience riding the range, he was perfectly situated to leave a record of those mythic times. He wrote: “The West has passed-more’s the pity. In another twenty-five years the old-time westerner will have gone too-gone with the buffalo and the antelope. I’m going to hand down to posterity a bit of unadulterated real thing if it’s the last thing I do….” His slightly stylized and beautifully patterned canvases are still considered the benchmark for cowboy art of the Southwest. 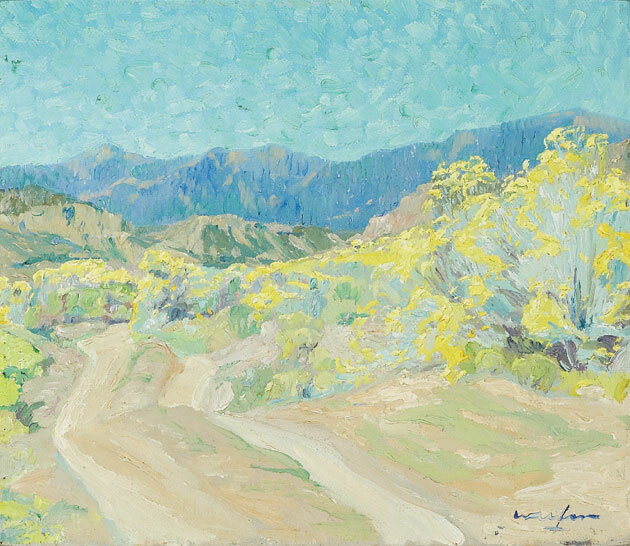 Ernest Martin Hennings (1886-1956) was an up-and-coming Chicago artist sent to Taos on commission in 1917 by Mayor Carter Harrison and other wealthy Chicago collectors. By 1921 he had decided to make Taos his permanent home, and was elected to The Society in 1924. Like those before him, Hennings was enchanted with the people of Taos and the way they made their lives in the majestic mountain and desert landscape. Unlike many of his colleagues, however, recording Native ceremonies, artifacts, and activities for posterity was not important to his art. 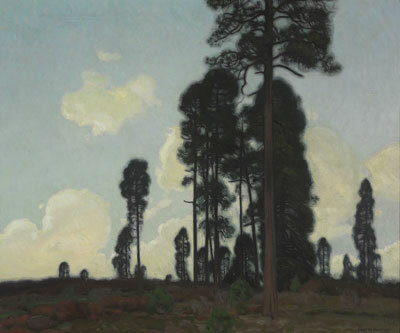 Hennings was more interested in the pictorial possibilities of his surroundings. The way light and shadow played in an aspen grove, the bright colors of an Indian blanket, a lone rider under the cottonwoods: such were the elements he wove together in his strongly patterned and light-filled canvases. Hennings was influenced by the decorative work of the European Art Nouveau, which shows in the undulating lines and organic shapes in his paintings. Whatever the subject, his goal was to reveal its visual richness through pattern and light. 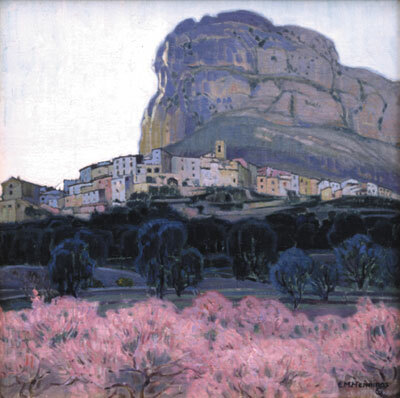 Catherine Carter Critcher (1868-1964) was already an acclaimed portrait painter and art teacher in Washington, D.C. when she decided to spend summers painting in New Mexico in the 1920s. She was quickly embraced by the Society and became its only female member in 1924. In Taos, Critcher found a welcome break from painting the society mavens and political leaders who were her main subjects in the East. 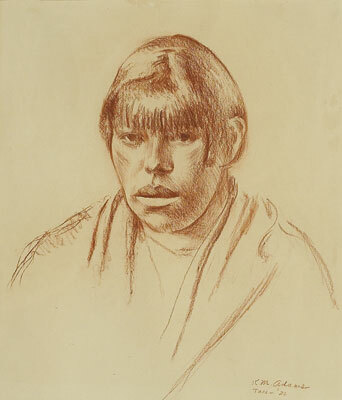 Her portraits of local Native and Hispanic subjects are character studies which demonstrate a desire to understand their psychological as well as physical make up. Critcher was the only member of The Society who did not eventually make a permanent home in Taos. Consequently, her New Mexico paintings are relatively rare and she has been undeservedly slighted in many writing on the Taos Society of Artists. Three members of The Society, Ernest Blumenschein, Victor Higgins, and Kenneth Adams, were more heavily influenced by the tenets of modernism than were their colleagues. Although deeply moved and inspired by the same cultures and landscapes of Taos, their goal was to use the visual and emotion impact of local subjects as a means to explore the pure aesthetics of painting: the visual relationships between line, form, color, light and composition. Although modernist influence is very apparent in their work, none of the three followed the avant garde of the day into abstract painting. They were very content to be representational artists who used modernist ideas to see familiar subjects in new ways. Ernest Leonard Blumenschein (1874-1960) was present at the birth of the Taos art colony in 1898, but he was the last of the founding members of the Society to make Taos his permanent home, moving from New York in 1912. His art shows deep respect and appreciation of the lives and cultures of the Indian and Hispanic peoples of Taos. He portrayed the people, their work, and their ceremonies with great dignity, but also with a frankness that revealed the difficulty of their daily lives and the unknowable depth of their spirituality. Blumenschein’s canvases celebrated-but did not romanticize or sentimentalize the work, the religion, and the history of Taos’ indigenous people. Rather than just recording the images in front of him, he brought out their emotional content by giving his paintings strong underlying structure, vibrant color, and stylized, rhythmic forms. W. Victor Higgins (1884-1949) was the first of three Society members to be sent to Taos on commission by Chicago Mayor Carter Harrison. Arriving in Taos at the end of 1913, he became a permanent resident the next year, and a member of the Society in 1917. Like most of his colleagues, Higgins received a traditional, academic art education in such places as Chicago, New York, Paris, and Munich. Once he mastered the fundamentals of technique, however, he devoted himself to exploring the aesthetic theories of progressive painters such as Robert Henri and his group, The Eight. After arriving in Taos, he studied the ideas of Cezanne and his followers in Europe, and those of the influential American modernist, John Marin. From this great wealth of influences, Higgins developed his own style of angular-almost abstract-forms, firmly structured, and given volume with bright color. As a representational painter, Higgins’ goal was to express the spirit or essence of the subject. But as a devoted student of contemporary aesthetic theory, he used each subject as an opportunity to explore new possibilities in creative expression. Kenneth Miller Adams (1897-1966) was The Society’s youngest member and the last to be elected to the organization, joining in 1926. Like his predecessors in The Society, Adams took his greatest artistic inspiration from his new Indian and Hispanic neighbors. He depicted his subjects with a straightforward simplicity that revealed the sitter’s personality without a hint of the sentimental. Adams modernist teachers had stressed the importance of not only rendering a physical likeness, but also creating an image that succeeds apart from its subject. In addition to its literal content, the image must be a dynamic composition of expressive line and form organized according to underlying pattern and structure. Walter Ufer (1876-1936) first arrived in Taos in 1914 under the patronage of Mayor Carter Harrison and immediately found his new home. He joined The Society in 1917 and became a permanent resident of Taos in 1920. Ufer’s work is difficult to categorize and, in some respects, it stands alone within The Society. He was captivated by the light, landscape, and ancient cultures of New Mexico, yet his work was not romantic or celebratory. He worked in a highly realistic style, relying on traditional techniques, yet the way he presented his subjects was highly untraditional. He believed that painting was an exercise in composition, line, and color, but made no movement toward abstraction like his modernist colleagues. The key to these apparent contradictions was that Ufer had a social as well as aesthetic agenda for his art. A committed Trotskyite, he deeply believed in the dignity of all people, their right to be free of oppression and injustice, and their right to make a decent living for honest work. 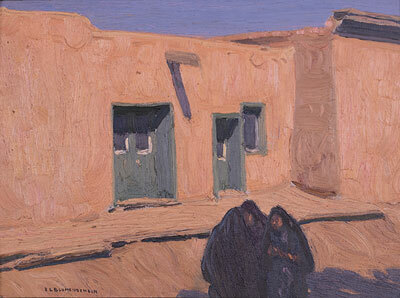 His artist’s eye was irresistibly drawn to the visual richness of Taos and its inhabitants. But he also recognized that the Native and Spanish peoples of the Southwest were being repressed and overwhelmed by the political, cultural, and economic gale-force of Anglo society. Whereas Ufer reveled in the beauty of the landscape with its brilliant, clear light, he peopled his paintings with Indian and Hispanic subjects caught in the reality of their menial jobs and daily hardships. Dignified, quiet, and hardworking, their lined faces range from expressionless to skeptical; intent eyes often staring out from the canvas as if to confront the viewer. The painting are made all the more dramatic with highly inventive compositions and intense color heightened by hard light and shadow. Aesthetically complex and visually arresting, Ufer’s work combined New Mexico’s transcendent beauty with its harsh realities to make art that challenges us on every level. The Taos Society of Artists comprised a wide variety of artistic philosophies, styles, and temperaments. Members agreed and disagreed about painting; they quarreled and made lifelong friendships. But it was not art nor friendship that held the group together for 12 years: it was business. Because New Mexico provided almost no market for their painting, these pioneer artists needed vehicles for selling their work elsewhere. The Society’s main activity was organizing traveling exhibitions which were shown at museums and galleries around the country. The shows brought both sales and publicity which, in turn, generated sales in the galleries that represented them in several Midwestern and Eastern cities. 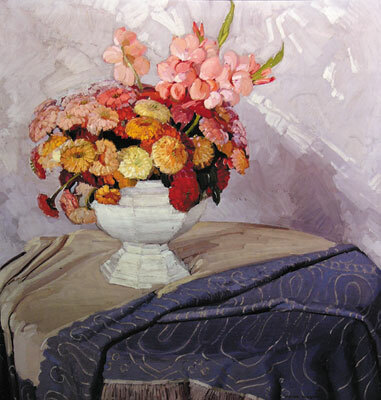 By the mid-1920s, most members of The Society enjoyed national reputations, had won many of the major national competitions, and were making most of their sales through galleries rather than The Society’s own exhibitions. The group voted to disband in 1927, realizing The Taos Society of Artists had outlived its usefulness. The end of The Society did not mean the end of the Taos art colony. All of the members, except Catherine Critcher, continued to live and work in Taos for the rest of their lives. And, almost from the beginning, they were joined by many artists of regional and national prominence including Maurice Stern, Andrew Dasburg, Marsden Hartley, Nicolai Fechin, Leon Gaspard, Gene Kloss, Howard Cook, Barbara Latham, Emil Bisttram, Cady Wells, Doel Reed, Thomas Benrimo, R.C. Gorman and many others. In their individual styles, these artists carried on the work started by The Taos Society of Artists: interpreting the sublime beauty of the New Mexico landscape and the cultural heritage of its diverse people. This article was excerpted from Canyon Road Arts: The Complete Visitors Guide to Arts, Dining and Santa Fe Lifestyle, Vol 2, 2006-2007, pages 108-119. Canyon Road Arts is published by Medicine Man Gallery. All rights reserved.